An early streamer emission (ESE) terminal monitors the surrounding voltage in the air, since thunderclouds create an electric field directly beneath them. When sensing a high electrostatic field, early streamer emission lightning conductors generate controlled magnitude and frequency pulses to create upward streamers. - We are leading manufacturer of all types of Brass Terminals as per specifications. - We manufacture Brass connectors and Brass Parts in various sizes and specifications. - We are dedicated to supply quality brass nuts and brass bolts. - We also manufacture brass parts as per customer's drawings and specifications. 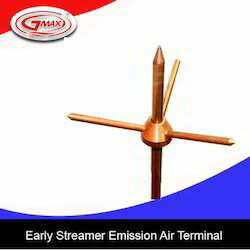 With rich industry experience & knowledge, we have been able to provide the best array of Electrical Brass Terminal. We bring forth precisely engineered Fuse Terminals which are manufactured for cables. Our Fuse Terminals are fabricated with latest technological designs and are manufactured from pure metals. Fuse Terminals that we provide are available in various sizes as required by the clients. Our Fuse Terminals are available at competitive rates. We are the leading organization actively occupied in providing an extensive series of Wiring Harness Terminal 350 Series. This product is presented in numerous of specifications. When it comes to Brass terminals, there are only a few alternatives to our company. Our Brass PCB terminals are one of the best and are made up of the best quality material. We offer our Brass cable terminals and Brass wire terminals at competitive prices. We are also one of the reliable Brass terminals exporters from India. Being a quality-centric organization of this industry, we are engaged in providing a wide array of Brass Terminals.